Picture your dream living room; is this chair part of it? It certainly could be. This chair's majestic look inspires romantic feelings that are fostered by the elegant T-Shaped seat and knife edged back cushions draped with contrasting welt. Pleated, rolled arms, also with contrasting welt, and turned legs turn dreams of living in a grand castle into reality with their ornate appeal. Two accent pillows are included with the sofa. 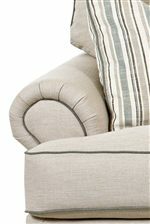 The various fabrics, with contrasting welt cords, will create a fabulous look of comfort. All cushions and pillows are down filled, ensuring the comfort matches the great style of the chair. The Ashworth D95200 Traditional Upholstered Chair with T-Shaped, Down Cushions, Rolled Arms and Turned Legs by Klaussner at AHFA in the area. Product availability may vary. Contact us for the most current availability on this product. Dreams of elegance and class can begin to be fulfilled with the Ashworth collection. This classically designed collection is distinguished by the knife edge, T-Shaped back cushions and T-Shaped seat cushions; both draped in contrasting welted detail that allows the sofa fabric to pop. Pleated rolled arms establish a fond look; one of gracious class. 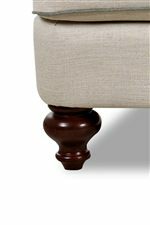 Turned, spindle legs are the support of the collection and carry the ornate nature of this collection. 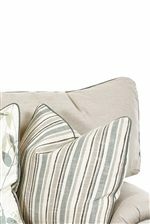 The collection includes also includes plush accent arm pillows that provide added style and comfort. The sofa and pillows are available in a multitude of fabrics that allow you to create your elegant dream the way you want it. The Ashworth collection features down blend cushions and pillows which provide supreme comfort in addition to the great style. The Ashworth D95200 collection is a great option if you are looking for Traditional furniture in the area.